After a few weeks of mental turmoil, I’m finally beginning to wrap my head around this whole competition dilemma. It’s taken a lot of reflection, a lot of naps, and a lot of beer for me to figure the whole thing out, but then it hit me: just go back to the start. I’ve been struggling a lot lately with the direction in which my life is headed, where I want it to go, and what I want to accomplish. Big-hearted, but far from naive, I want to change lives in such a way that my mark is left on this world. Our actions, and sometimes lack thereof, affect the people around us, so why not do something worth a damn? I pouted, I moped, I slept, I neglected the gym, and I neglected communicating my reasons with the people I love. Luckily I’m fortunate to have such a relationship with Los that he respects my space when I get like this, and when the time is right (which he seems to always know) he asks. So last night I was reminded that I do have purpose and that I already have impacted some lives. 4 years ago, when I became truly involved in fitness by managing a small-town gym, I just worked paycheck to paycheck while in nursing school. It wasn’t until I had an ED relapse for the second time that I really took charge of my life and began to utilize the information I’d learned from working in healthcare. With that, I started working out and eating right, and thus my journey really began. In the last 4 years I have gained 30lbs, lost 10, gained it back, etc; so my decision to compete again this year was also an attempt to prove that I could do this ‘the right way,’ and maintain a healthy mental status while also a healthy body. I’ve had so many people commend my efforts, and grown in a lot of my relationships through this. I’ve influenced at least 3 people that I know of to get off their asses and lose weight that they wanted to lose. I’ve made meal plans for a few friends, and even trained a few. Maybe those small incidents are not life-changing for me, but as Los pointed out, it’s been eye-opening for others. When I quit my competition diet, I immediately gained 5lbs and I panicked. I kind of spiraled into this pseudo-depression about my body. After all this hard work and dedication, I failed. I struggled to eat all my meals, to make it to the gym, to even bring myself to put makeup on in the mornings. So Los gave me some space, gave me some time, took care of things around the house, and then I blossomed again. I’m not 137lbs, I’m not even 120lbs again, and when did weight become such an issue anyway? 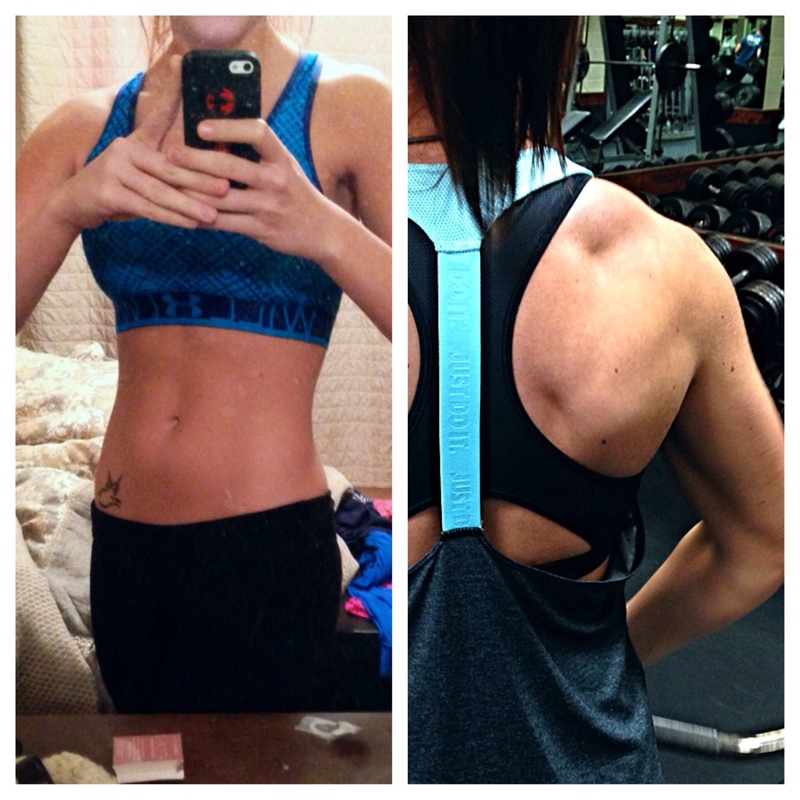 All of my ‘competition season’ clothes still fit, and I feel better, so why was I being so hard on myself? I can actually go out on a Wednesday night and enjoy a dinner/beer with my friends, I can guiltlessly eat a slice of pizza, I can actually experiment in the kitchen again. I’ve sort of regained my freedom, and I can still be an inspiration and motivator for people because now I can balance my life with my fitness goals. They say that a lot of women experience the same emotions post-competition, so I suppose in a way I’m just as normal as any other, especially having been to therapy twice for a body image disorder. This has been just a taste of what’s to come to prepare me even further for next season. In the meantime I’m continuing to make meal plans and work towards my goals; I’m gaining muscle, but still leaning out a little for beer, I mean bikini season, and I’m doing it at my own pace. I forgot for awhile that I dove into the world of fitness for the health reasons, and there’s nothing healthy about a woman with 8% body fat. As I prepare my body for next season’s torture I’m going to continue to experiment with what works best for me mind, body and soul, and I’m going to continue to share my story in hopes that someone can relate and gain a little peace of mind knowing they aren’t alone either. This entry was posted in Uncategorized and tagged anorexia, bikini, body image, career, challenge, competition, diet, direction, eating, eating disorder, emotion, exercise, fitfam, fitness, flex, food, hard work, health, healthy, life, motivation, muscle, npc bikini, pay off, purpose, relapse, therapy, wellness, women. Bookmark the permalink.